The Different Ways Of Cooking Eggs. Have you ever heard of people saying that they cannot cook anything but eggs? Then the next question to ask them is if they do know how to use all the methods of cooking eggs. I do not know how to but I would love to eventually. 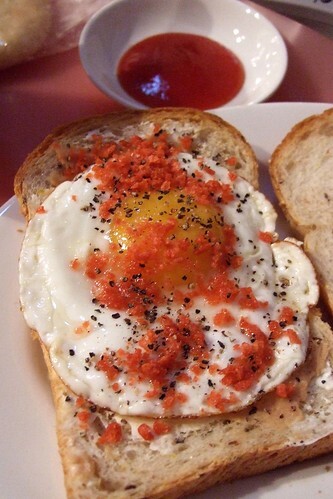 There are numerous ways to cook eggs. Here are some of my favourites. 1. Over-easy, and eaten early in the morning with economical fried bee hoon. 2. Scrambled, with loads of garlic, dried shrimp and sliced onions. 3. Steamed, and accompanied with rice and other complimenting dishes. Of course, I could not do without eggs when it comes to baking. It is absolutely necessary. Click here and here for more egg information and recipes. 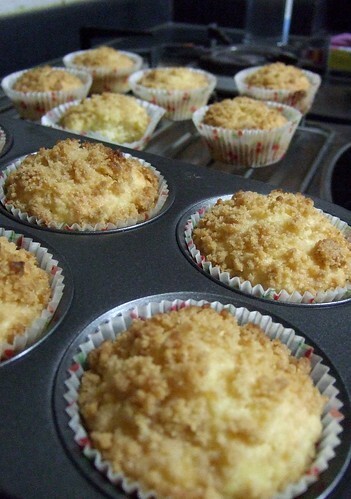 Fruit Muffin Crumble Topping Recipe. As promised in my previous post, here is the recipe I use for all my fruit muffins. It really brings so much more flavour and texture to the muffins. It is for anyone with a super-sweet tooth. 1. In a bowl, mix all the ingredients together and mix it with your finger tips (as it is the coolest part of your hands and it will prevent the butter from melting too quickly). Mix till a crumble consistency is achieved. 2. Sprinkle over un-baked muffin, before placing muffins into the oven. 3. Enjoy a delicious muffin(s) with tea! I also mentioned that I had my fair share of problems while baking muffins. My muffins would sometimes turn out like rocks and have large holes in them. I did the following to solve this. I avoid over-mixing my muffins by mixing the wet & dry ingredients with my hands, instead of a wooden spoon or electric mixer. However, somehow my banana muffins always don’t turn out as well as I would like them to. They aren’t that moist. Any tips? What If You Only Had These 12 Ingredients In Your Kitchen? My previous helper did not cook at home and hence my kitchen always had too little ingredients for me to whip up any dish. However I always managed to get creative, sometimes with the help of additional items (a quick visit to my Shop & Save supermarket, a five minute walk away). 1. Marinate the chicken (cut into small pieces) with Herbs & Spices for an hour in the fridge before cooking. 3. Mince garlic and cook in butter till lightly browned. 4. Add in chicken and fry over low heat. 5. Add in sliced mushrooms and continue to mix till it softens. 6. Add more Herbs & Spices/Salt to taste. 7. Mix in the cooked pasta and serve. 1. Pre-heat oven to 180 °C. 2. Slice and core the apples. 3. Rub flour, sugar and cubed butter together till it resembles breadcrumbs. 4. Place apples into a bowl and sprinkle over some sugar and incorporate it lightly with your hands. 5. Butter a baking dish and place apples in first, followed by the “breadcrumb-looking” crumble. 6. Bake in oven for 40 to 50 minutes until you see the apple browning and the crumble looking gorgeously golden brown. What would you cook if you only had these 12 ingredients in your kitchen? Tags:12 ingredients, apple, Apple Crumble, apple dishes, apple recipes, apples, butter, chicken, chicken dishes, chicken egg, chicken eggs, chicken meal, chicken recipes, chocolate, egg, egg recipes, eggs, few ingredients, fresh mushrooms, garlic, garlic recipes, herb, herb recipes, Herbed Mushroom & Chicken Pasta, herbs, herbs & spices, herbs and spices, ingredient, ingredients, kitchen, kitchen ingredients, less ingredients, limited ingredient, limited ingredients, little ingredients, minced garlic, mushroom, mushroom recipes, mushrooms, pasta, pasta recipes, recipe, recipes, rice, salted butter, Shop & Save, simple Apple Crumble, spice, spice recipes, spices, sugar, sugar recipes, unsalted butter, what if, what to cook, what would you cook?